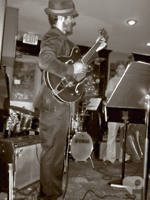 Roger Noyes is a cross-genre guitarist whose playing is rooted primarily in blues-oriented forms. He currently writes and performs with the Arch Stanton Quartet, whose music finds influence in post-bop jazz, but Noyes also performs with groups specializing in other genres, from straight-ahead jazz to barroom/roots rock. His instrumental writing and playing, in particular, are inspired by the likes of Thelonious Monk, Frank Zappa, John Scofield, Nels Cline, Grant Green and Danny Gatton: musicians who are genre-bending, take an "unusual" approach to harmony, and/or have a strong blues-soul sensibility. He also plays bass and pedal steel in local rock groups.